At Blue Door Painting, we love using neutrals in decor and design. That said, we’re not afraid to take a home like our recent Ravenswood revamp and up the color quotient for a bolder interior look. Our August Job of the Month started as a drab multi-level home that relied too much on beige and brown tones throughout the entire structure. Walls, floors, even decorative elements were so neutral that they all blended together. We teamed up with Jasmin Reese Interiors to create a color scheme that could make this home’s decor and style stand out. To complete this interior job, we painted the living room, formal living room, staircase and the kitchen. The main color theme was a beige and dark brown side-by-side combination that stretched the entirety of the walls. We updated this to one color - Hazy Skies OC-48 by Benjamin Moore - to streamline the room and make the space look cleaner and more spacious. To do this, we first had to remove the chair rail separating the two sections of wall to open up a clean, cohesive surface. The focal point of the main living room was a beautiful stone fireplace that was being vastly underutilized. We took the plain white framing and made a bold, black accent piece out of the entire portion of wall that housed the fireplace. The bright, contrasting decor added afterward really makes the accent stand out. You’ll notice in the “after” pictures that the homeowners have impeccable taste in both art and furniture. This home is incomparable in its decor, with gorgeous paintings and art pieces, along with modern, stylish furnishings. Even their plants worked with the room when we were done with it! 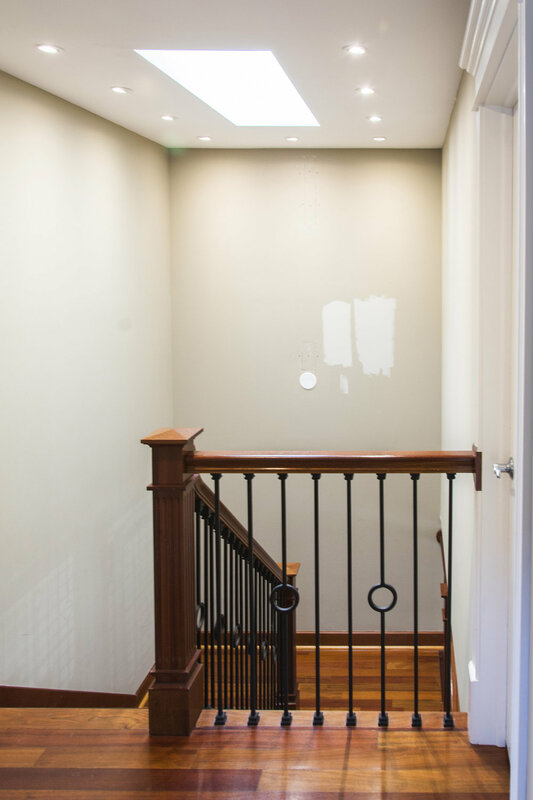 Next, we brightened the staircase walls with Hazy Skies OC-48 by Benjamin Moore for a cleaner look. Blue Door Painting is a five-star rated, highly experienced professional interior painting contractor that has been pleasing customers in the Chicago area for over 35 years. We are experts in complete, full-service interior house painting for existing homes, gut rehabs, home renovations and new construction projects.